To analyze the age-related changes in corneal spherical aberration (CSA) and higher order aberrations (HOAs) and to develop a novel model to estimate the change in CSA with age. This was a cross-sectional study of the right eyes of 3,769 patients. Anterior corneal spherical aberration (ASA), posterior corneal spherical aberration (PSA), total corneal spherical aberration (TSA), and the root mean square of corneal HOAs were measured using a Scheimpflug tomographer. Smoothed fitting curves were plotted as a function of age and the average change in spherical aberration was calculated for different ages. The mean magnitude of ASA, PSA, TSA, and HOAs (6 and 4 mm) were 0.270 ± 0.111, −0.144 ± 0.031, 0.228 ± 0.120, 0.453 ± 0.194, and 0.141 ± 0.075 µm, respectively. All parameters showed a statistically significant non-linear change with age. The age after which the aberrations increased at a faster rate, namely the turning points of age, were 39 years for ASA, PSA, TSA, and 6-mm HOAs (95% confidence interval [CI]: 35 to 42, 36 to 41, 36 to 42, and 35 to 56 years, respectively) and 46 years for 4-mm HOAs (95% CI: 36 to 56 years). There were significant increases in increment rates after the turning points. The average change of TSA was −0.013 µm/10 years from 18 to 39 years and 0.057 µm/10 years after 39 years. There were statistically significant correlations between ASA and TSA (r = 0.976, P < .001) and PSA and TSA (r = 0.192, P < .001), but not between ASA and PSA (r = −0.003, P = .835). CSA and HOAs increased non-linearly with age and became more positive after 39 and 46 years of age, respectively. Based on the increment rates and turning points of age, a novel model is provided to help calculate the value required to compensate for the increasing CSA associated with the aging cornea. Optical aberrations are one of the main causes for deterioration of overall retinal image quality.1 By eliminating corneal spherical aberration (CSA), which is the main higher-order aberration (HOA) of the cornea, overall HOAs may be reduced by a certain percentage and most of a patient's contrast sensitivity may be restored.2,3 In this regard, CSA and HOAs are becoming key concerns for intraocular lens (IOL) selection to achieve optimal visual quality after refractive cataract surgery. 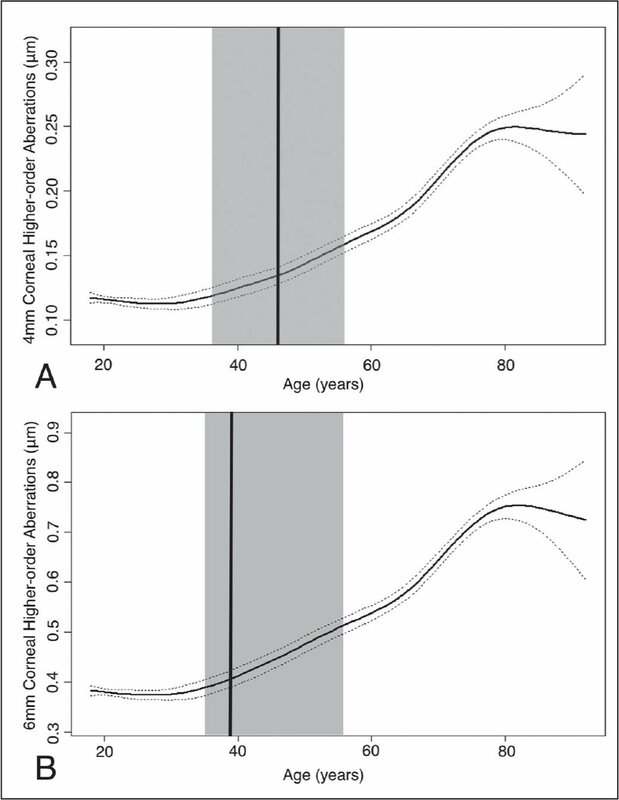 In an earlier study, we found that corneal astigmatism (which is part of lower order aberrations) showed a nonlinear change with age.4 We conducted the current research to investigate whether HOAs showed similar changes. Several authors have reported the age-related changes of CSA and corneal HOAs.5–8 However, the rate of change of CSA and corneal HOAs is not clearly understood in the aging process. The turning point for age at which CSA or HOAs increase at a faster rate has not been investigated. The concept of selecting personalized market available aspheric IOLs (with zero or different negative spherical aberration values) based on the preoperative CSA values has been widely accepted and put into practice.9 Nevertheless, these procedures only consider a one-time point and neglect the age-related changes of corneal aberrations for the long term. To reduce the symptoms after cataract surgery, the age-related CSA changes should not be ignored when setting the target for postoperative aberrations. The purpose of this study was to analyze the changes of CSA and corneal HOAs as a function of age and to provide a model to compensate for the anticipated increase in age-related changes in corneal spherical aberration after refractive cataract surgery. Our findings might change the guidelines for refractive cataract surgery when selecting aspheric (spherical aberration) and multifocal (HOAs) IOLs. We thus introduce a novel model to estimate the increment rates of aberration according to age. This cross-sectional study enrolled patients undergoing Scheimpflug topography (Pentacam; Oculus Optikgeräte, Wetzlar, Germany) at The Eye Hospital of Wenzhou Medical University from January 2012 to February 2016. The right eye of patients aged 18 years and older was examined and a “Quality Specification,” which was checked as the quality of “OK,” showed that more than 95% had valid data and were eligible for inclusion in the study. Exclusion criteria were: a previous history of ocular surgery or any corneal disease such as corneal degeneration, pterygium, active keratitis, and suspect keratoconus; patients who reached the Scheimpflug topographer's built-in Amsler keratoconus topographic maps grade standards; and patients with a history of rigid contact lens use within the past 4 weeks or soft contact lens use within 1 week prior to the examination. The Scheimpflug topography captured 50 single images within 2 seconds for each eye. All individuals underwent Scheimpflug tomography examination three times repeatedly and only one examination with best “Quality Specification” evaluated by the software was recorded. The study was approved by the Ethics Committee of The Eye Hospital of Wenzhou Medical University and followed the tenets of the Declaration of Helsinki. Patients were properly informed and oral consent was obtained. All analyses were performed using SPSS for Windows (version 23.0; SPSS, Inc., Chicago, IL), Empower ( www.empowerstats.com; X&Y solutions, Inc., Boston, MA), and R ( http://www.R-project.org) software. Normality of data distribution was analyzed by the Kolmogorov–Smirnov test. Pearson's correlation test evaluated the relationship between ASA, PSA, TSA, and HOAs with age and the relationship between the CSA parameters. Smoothed fitting curves for ASA, PSA, TSA, and HOAs were graphed as a function of age and turning points of age were determined by threshold effect and saturation effect analysis. Piecewise linear regression based on Pearson's correlation test according to the turning points of age was conducted and the average change was calculated. A P value of less than .05 was considered statistically significant. The right eye of 3,769 patients was examined. The mean age was 38.17 ± 20.22 years (range: 18 to 92 years; Table 1). The mean magnitudes of ASA, PSA, TSA, and HOAs (6 and 4 mm) were 0.270 ± 0.111, −0.144 ± 0.031, 0.228 ± 0.120, 0.453 ± 0.194, and 0.141 ± 0.075 µm, respectively. The demographic data of these five parameters in different age groups are shown in Table 1. The smoothed fitting curve of ASA as a function of age showed the turning point for age for ASA to be at 39 years (95% confidence interval [CI]: 35 to 42; Figure 1A). The mean value before the turning point was 0.235 ± 0.080 µm (range: −0.217 to 0.530 µm). Piecewise linear regression according to the turning point demonstrated an increment rate of −0.007 µm/10 years (95% CI: −0.013 to −0.001; r = −0.045, P = .034). The mean value of ASA after the turning point was 0.326 ± 0.129 µm (range: −0.254 to 1.215 µm) with an increment rate of 0.044 µm/10 years (95% CI: 0.039 to 0.050; r = 0.413, P < .001; Figure AA, available in the online version of this article). Smoothed fitting curves of (A) anterior corneal spherical aberration (ASA), (B) posterior corneal spherical aberration (PSA), and (C) total corneal spherical aberration (TSA) as a function of age. The turning points of age were found at (A) 39 years, 95% confidence interval (CI): 35 to 42; (B) 39 years, 95% CI: 36 to 41; and (C) 39 years, 95% CI: 36 to 42. The middle lines represent the smoothed fitting curve and the upper and lower dotted lines represent the 95% CI of the smoothed fitting curve. The vertical lines represent the turning points of age and the gray area signifies the 95% CI of the turning points. Piecewise linear regression of the (A) anterior corneal spherical aberration (ASA), (B) posterior corneal spherical aberration (PSA), and (C) total corneal spherical aberration (TSA) values as a function of age. The average change of aberration per 10 years for 18 to 39 years and older than 39 years were −0.007 and 0.044 µm for ASA, −0.008 and 0.013 µm for PSA, and −0.013 and 0.057 µm for TSA, respectively. The turning point of age for PSA was at 39 years (95% CI: 36 to 41; Figure 1B). The mean value before the turning point was −0.150 ± 0.025 µm (range: −0.264 to −0.014 µm) with an increment rate of −0.008 µm/10 years (95% CI: −0.010 to −0.006; r = −0.180, P < .001). After the turning point, the mean value increased to −0.133 ± 0.037 µm (range: −0.238 to 0.048 µm) with an increment rate of 0.013 µm/10 years (95% CI: 0.012 to 0.014; r = 0.438, P < .001; Figure AB). The turning point of age for TSA was at 39 years (95% CI: 36 to 42; Figure 1C). The mean value of TSA before the turning point was 0.185 ± 0.079 µm (range: −0.250 to 0.490 µm) with an increment rate of −0.013 µm/10 years (95% CI: −0.019 to −0.006; r = 0.084, P < .001). The mean value after the turning point increased to 0.296 ± 0.140 µm (range: −0.303 to 1.249 µm) with an increment rate of 0.057 µm/10 years (95% CI: 0.052 to 0.062; r = 0.490, P < .001; Figure AC). The turning points of age for 4- and 6-mm HOAs were at 46 years (95% CI: 36 to 56) and 39 years (95% CI: 35 to 56), respectively (Figure 2). For 4-mm HOAs, the mean value before the turning point was 0.116 ± 0.048 µm (range: 0.035 to 0.821 µm) with a mild increment rate of 0.003 µm/10 years (95% CI: 0.0005 to 0.0055; r = 0.046, P < .001). After 46 years, the mean value increased significantly to 0.191 ± 0.093 µm (range: 0.036 to 0.806 µm) with an increment rate of 0.036 µm/10 years (95% CI: 0.031 to 0.041; r = 0.379, P < .001; Figure BA, available in the online version of this article). The percentage of eyes with HOAs larger than 0.3 and 0.5 µm increased significantly with age (P < .001), but the percentage was relatively small (3.87% and 0.74%, respectively; Table 2). Smoothed fitting curves of higher order aberrations (HOAs) as a function of age. (A) The turning point of 4-mm HOAs was 46 years (95% confidence interval [CI]: 36 to 56. (B) The turning point of 6-mm HOAs was 39 years (95% CI: 35 to 56). The middle line represents the smoothed fitting curve and the upper and lower dotted lines represent the 95% CI of the smoothed fitting curve. The vertical line represents the turning point of age and the gray area signifies the 95% CI of the turning point. Piecewise linear regression of the (A) 4-mm and (B) 6-mm higher order aberrations (HOAs) values as a function of age. (A) For the piecewise linear regression of 4-mm HOAs, the average change of HOAs was 0.003 µm/10 years for 18 to 46 years and 0.036 µm/10 years for older than 46 years. (B) For the piecewise linear regression of 6-mm HOAs, the average change of HOAs was 0.00087 µm/10 years for 18 to 39 years and 0.087 µm/10 years for older than 39 years. For 6-mm HOAs, the mean value before the turning point was 0.379 ± 0.120 µm (range: 0.155 to 1.785 µm) with a mild increment rate of 0.00087 µm/10 years (95% CI: −0.008 to 0.010; r = 0.004, P = .851). After 39 years, the mean value increased significantly to 0.571 ± 0.228 µm (range: 0.192 to 2.005 µm) with an increment rate of 0.087 µm/10 years (95% CI: 0.078 to 0.096; r = 0.457, P < .001; Figure BB). All five parameters demonstrated a non-linear increase with aging (Figures 1–2). There was no correlation between ASA and PSA (r = −0.003, P = .835). A strong positive correlation was observed between ASA and TSA (r = 0.976, P < .001; TSA = 1.0522 × ASA − 0.0561; Figure C, available in the online version of this article). The PSA had a slightly positive correlation with TSA (r = 0.192, P < .001). 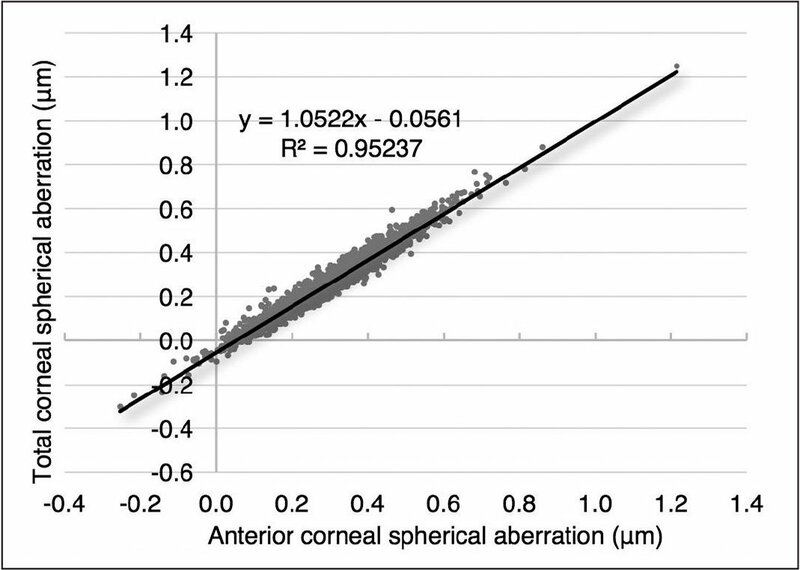 Correlation between anterior corneal spherical aberration (ASA) and total corneal spherical aberration (TSA). There was a statistically significant correlation between ASA and TSA (r = 0.976, P < .001). 40 to 76 years = TSA + (76 – Age) / 2 × 0.0057 A conversion formula estimating the TSA based on the ASA values was also formed. This study shows that both CSA and corneal HOAs increased non-linearly with age. Two turning points of age were found: 39 years for the CSA and 6-mm HOAs and 46 years for the 4-mm HOAs. Past studies that denied the age-related changes in spherical aberration of the cornea may have been related to their small sample size.15–17 This study expands on prior research by studying a larger number of eyes with a wider range of age. As such, PSA also showed significant changes with aging. A negative correlation was observed before the turning point at 39 years, after which a positive correlation with age was noted. De Sanctis et al.20 reported no statistically significant correlations between PSA and age in either men (r = 0.15; P = .19) or women (r = 0.15; P = .10), whereas Navarro et al.28 reported age-related changes of PSA (r = 0.016; P < .05). In the current study, patients who were in their 30s had close-to-zero PSA values. This is in agreement with Sicam et al.,29 who found PSA was negative in younger patients, close to zero in patients who were in their 30s, and shifted toward positive values with increasing age. Past studies have highlighted the contribution of the posterior corneal surface to the spherical aberration of the cornea.30 Nonetheless, due to the smaller difference in refractive index between the cornea and the aqueous humor, the posterior contribution is relatively smaller but of clinical significance and should not be ignored.31 The TSA showed a strong positive correlation with age with a significant increase in increment rates observed after 39 years of age. 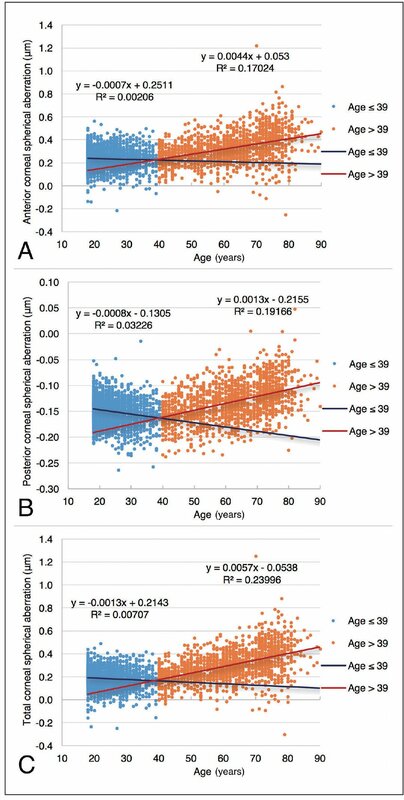 The difference in age-related changes in the polarity of TSA from 18 to 92 years was approximately 0.2 to 0.3 µm, with a moderate standard deviation showing inter-individual variability. Among all parameters, the mean value of ASA was the highest and the mean PSA value was the lowest, consistent with the theoretical optical properties of the corneal surface. The anterior corneal surface is the most important refractive interface of the eye due to the large difference in refractive index between air and cornea.32 The mean TSA value was slightly lower than the mean ASA value because it comprised compensation by PSA. The range of TSA from −0.303 to 1.249 µm stresses the importance of inter-patient variability. To accurately measure and compensate for the TSA, the entire surface of both the anterior and posterior cornea should be analyzed.20 Our results demonstrated that the ASA coefficients negatively correlated with the PSA coefficients in agreement with a study by Atchison et al.33 An evidently strong positive correlation was found between ASA and TSA, based on which a conversion formula was derived (Figure C). Due to the cost effectiveness, the devices to measure TSA or PSA values may not be available in some regions. The conversion formula (TSA = 1.0522 × ASA – 0.0561) may thus help to calculate the TSA based on the ASA value. A different turning point of age was found at 46 years for 4-mm HOAs. However, when we analyzed the turning point of age for 6-mm HOAs, it was 39 years, corresponding to the CSA parameters. This finding indicates that the age-related trends of CSA and corneal HOAs are similar. The difference between the 4- and 6-mm diameter suggests that the progress of HOAs may not be the same in different parts of the optical zones. The age-related changes for HOAs probably begin at the peripheral zone, worsening more rapidly in earlier age compared to the central 4-mm optical zone. A previous study reported the keratometry value of the anterior surface increases while that of the posterior value decreases, causing peripheral thinning of the cornea as a function of age.34 Another study demonstrated the cornea steepened in the center and flattened in the periphery, changing the overall shape of the cornea to a more prolate form.35 Herein, the contrast in turning points of age between the two optical zones could be due to the peripheral thinning and flattening of the cornea. The anticipated age-related increase of the corneal aberration must be addressed after refractive cataract surgery to reduce the symptoms associated with HOAs in elderly patients.36–39 A previous study reported that HOA values greater than 0.32 µm may result in intolerable dysphotopsia in the presence of a diffractive optics multifocal IOL.40 Of note, multifocal IOL implantation is not advisable in HOAs that exceed 0.3 µm. According to our results (Figure BA), the mean value of HOAs (4 mm) was 0.116 µm at younger than 46 years and increased to a range of 0.2 to 0.3 µm after the turning point. Based on our analysis, the increment rate was 0.0036 µm/per year. Hence, if the HOA value of a 47-year-old patient was approximately 0.2 µm, after 30 years, it would increase to a total of approximately 0.3 µm. In 2016, according to the statistics of the World Health Organization, the life expectancy of the Chinese population was 76.1 years. Our data analysis (Table 2, Figures 2 and B) showed the HOAs are still predicted to be less than 0.3 µm in most individuals of this age. Furthermore, the increment rate was remarkably small. Based on our analysis, the long-term prospects of multi-focal IOL implantation seem to be favorable for lifelong use. Conversely, we need to pay attention to the percentage of individuals with HOAs exceeding 0.3 and 0.5 µm (3.87% and 0.74%, respectively). Although the percentage was notably small, it highlights the importance of inter-individual variability. A personalized treatment plan should be developed based on the characteristics and dynamic variation of CSA to achieve the best compensation mechanism and provide satisfactory visual quality throughout the aging process. In this regard, two linear equations were designed based on the strong positive correlation of TSA with age. The refractive surgeon may customize the nomogram accordingly. 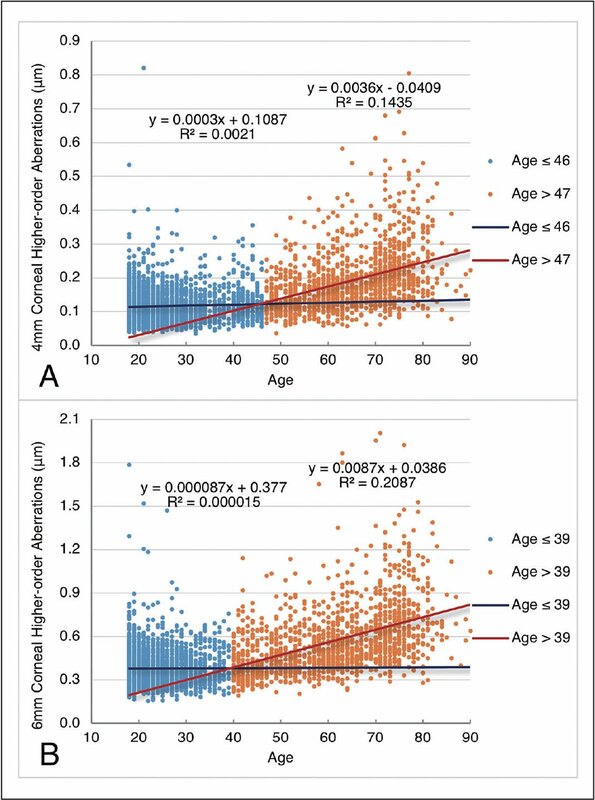 Considering the current age of a patient to be 40 years, and the life expectancy to be 76 years, the middle point set at 58 ([40 + 76] / 2 = 58) is assumed to be the best correction age. If a patient aged 40 years has a TSA of 0.2 µm at 58 years, it is predicted to increase by 0.102 µm per decade and amount to approximately 0.302 µm at 76 years. For this reason, it is essential to consider the consequent increase in CSA. The rate of change in TSA was higher after 39 years with an increment rate of 0.0057 µm/year and the total difference from 40 to 76 years was 0.211 µm. Accordingly, if we set the middle point at 58 years to be the best correction age, the retained spherical aberration and the subsequent spherical aberration would presumably not exceed 0.105 µm from the retained spherical aberration. If the patient is 39 years or younger, the surgery goal may be based on the first formula, setting the age of best correction at 58 years. If the patient is between 40 and 76 years old, the second formula (setting the middle point of current age and 76 years as the best correction age) may be used when a more rapid increase in spherical aberration is expected. For patients older than 76 years, the correction may be based on the current amount of TSA. The two formulas, based on the current age, the life expectancy, and the current value of TSA, are provided to help calculate the recommended correction value of TSA. It is well known that CSA is not the only factor that declines in vision. The benefit of correcting spherical aberration depends on relatively small contributions of other factors that potentially increase HOAs of the cornea; these include lens tilt, decentration, and corneal irregularities.41 Other factors that can help to decrease aberrations in the older population are senile miosis and a tolerance for defocus.42 Nonetheless, pupil size varies greatly in the older population. Beiko7 reported that spherical aberration has an impact on visual quality mostly when the pupil diameter is greater than 4 mm. The pupil size should therefore be measured under both scotopic and mesopic conditions to estimate the effect CSA may have on the visual quality. Optical quality can be restored to great lengths if all of these factors and the provision to compensate for CSA in the later decades of life are accounted for. We believe good visual satisfaction may be obtained throughout life. Limitations of this study include a larger group of young people compared to the older group. This may have masked certain trends in the older population. However, when we randomly removed some young patients to balance the sample size between each age group and reran the statistics, we obtained similar outcomes. Furthermore, a larger sample size makes the smoothed fitting curves and piecewise linear regression more accurate. Second, we only used the Pentacam data, whereas previous studies used a variety of methods with different devices. These differences might have an influence on the estimate of corneal spherical aberration.20 Our mean values were similar to the CSA (based on anterior corneal surface) reported by Holladay et al.26 and Beiko et al.,27 suggesting a lack of difference between aberrations in the Chinese and white populations. However, no research has reported the non-linear change of CSA with age in other ethnicities. Hence, further research to evaluate the age-related trend of CSA in different ethnicities should be conducted. Finally, because our research was a cross-sectional study, we did not have the longitudinal individual follow-up of the different CSA parameters. Because a longitudinal study lasts decades and requires extensive time and financial support, most previous studies have explored age-related changes in CSA through a cross-sectional design.8,16,27,43 In future studies, patients should be observed longitudinally and individual wavefront aberration data collected over a longer period of time to verify our findings. CSA and corneal HOAs increased non-linearly with age. After the turning points at 39 and 46 years old, respectively, CSA and HOAs increased at a faster rate. Based on the non-linear model to estimate the spherical aberration with age, the formulas were developed to calculate the recommended spherical aberration value to compensate for the increasing CSA according to age. The use of these formulas may help clinicians to predict and customize CSA before surgery. Clinical evaluation is required to verify whether it would improve the quality of vision following refractive cataract surgery. Packer M, Fine IH, Hoffman RS. Aspheric intraocular lens selection based on corneal wavefront. J Refract Surg. 2009;25:12–20. Maeda N, Ito M. Screening cataract surgery candidates with corneal topographer. In: Bissen-Miyajima H, Koch DD, Weikert MP, eds. Cataract Surgery: Maximizing Outcomes Through Research. Tokyo: Springer Japan; 2014:25–33. Klaproth OK, Buehren J, Otto K, Kohnen T. Repeatability of the corneal wavefront measurements with Pentacam HR. Invest Ophthalmol Vis Sci. 2011;52:4172. Holladay JT, Piers PA, Koranyi G, van der Mooren M, Norrby NE. A new intraocular lens design to reduce spherical aberration of pseudophakic eyes. J Refract Surg. 2002;18:683–691. Marcos S. Aberrations and visual performance following standard laser vision correction. J Refract Surg. 2001;17:S596–S601. From The Eye Hospital of Wenzhou Medical University, Wenzhou, Zhejiang, China. Supported by the Nature and Science Foundation of China (Grant no. 81570869), Nature and Science Foundation of Zhejiang Province, China (Grant no. Y2110784), Zhejiang Provincial Foundation of China for Distinguished Young Talents in Medicine and Health (Grant no. 2010QNA018), Foundation of Wenzhou City Science & Technology Bureau (Grant no. Y20140705 and Y20150076), and Engineering Development Project of Ophthalmology and Optometry (Grant no. GCKF201601).